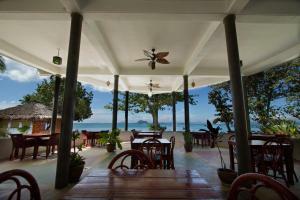 Santhiya Koh Yao Yai Resort & Spa - Koh Yao Yai, Phuket, Thailand - Great discounted rates! 8.9 out of 10 based on 1858 verified user reviews via Agoda. Stop at Santhiya Koh Yao Yai Resort and Spa to discover the wonders of Phuket. The hotel has everything you need for a comfortable stay. All the necessary facilities, including free Wi-Fi in all rooms, 24-hour front desk, luggage storage, Wi-Fi in public areas, car park, are at hand. All rooms are designed and decorated to make guests feel right at home, and some rooms come with television LCD plasma screen, bathroom phone, complimentary instant coffee, complimentary tea, fireplace. Entertain the hotel's recreational facilities, including hot tub, private beach, fitness center, outdoor pool, spa. No matter what your reasons are for visiting Phuket, Santhiya Koh Yao Yai Resort and Spa will make you feel instantly at home. Santhiya Koh Yao Yai Resort & Spa - Phuket classifies itself as a 5 star hotel.